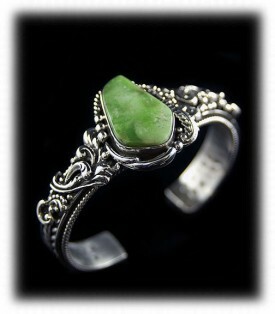 Green Turquoise comes from most areas in the world where Turquoise is found. The green colored Turquoise is caused by higher concentrates of iron in the stone. Faustite concentrates will actually create lime green Turquoise. Nevada is famous for American green Turquoise, many Turquoise deposits throughout Nevada produce spectacular shades of Green Turquoise from lime to a rich dark green. Some of the more famous mines are the Royston Turquoise Mine, Blue Gem Turquoise Mine, Orville Jack Turquoise Mine, Carico Lake Turquoise Mine, Battle Mountain Turquoise Mine, Pilot Mountain Turquoise Mine, Fox Turquoise Mine, Damele Turquoise Mine and the Tortoise Turquoise Mine. 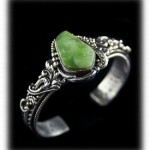 Nevada Green Turquoise Jewelry has been popular among Turquoise collectors for generations and today it has become scarce do to the slow down in Turquoise mining in Nevada. Government restrictions and cost of mining has caused this slowdown and due to this fact,Nevada Green Turquoise values are going through the roof. Nevada produces the most beautiful Green Turquoise in the world. The bold and vivid green Turquoise that comes from this region is second to no other Turquoise on earth. From lime green, emerald greens to military greens, green Turquoise from Nevada is tops. To the left is an example of Nevada Green Turquoise, this is a piece of Royston Turquoise from the Tonopah, Nevada area. Royston Turquoise runs from blue to green, it has a lot of variations in its colorations and quite often rich greens run through blue Turquoise which is very dynamic. Royston Turquoise has a golden brown colored matrix and often spiderweb matrix. If interested, the Ottesons who own the Royston Turquoise Mine give tours of the Mine and along with the tour you are allowed to hunt for your own Royston Turquoise. It is a lot of fun and you can get more information on the Royston Turquoise Mine Tours here. To the right is an example of lime green Carico Lake Turquoise. The Carico Lake Turquoise Mine has faustite in the ground which is what has made this Turquoise the brilliant lime green color. This Turquoise can run in different shades of lime to deep green in color and often has water webbing of emerald-green colorations. Another form of Carico Lake Turquoise has a spring green or light lime green color running through a beautiful powder sky blue Turquoise, is special and spectacular. The Carico Lake Turquoise Mine also produces fossilized Turquoise and ancient Clams that Turquoise formed in millions of years ago. The mine produces a large amount of blue Turquoise as well. Matrix in Carico Lake Turquoise runs from almost white to golden browns and even shades of black. 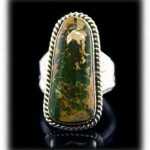 This green Turquoise Ring was made by John Hartman of Durango Silver Company of Durango, Colorado USA. John has been a prolific Southwestern Jeweler for decades, he has designed Silver Jewelry for many department chains, National Parks, the Fred Harvey Co and he has used a lot of Royston Turquoise in his work for many years. 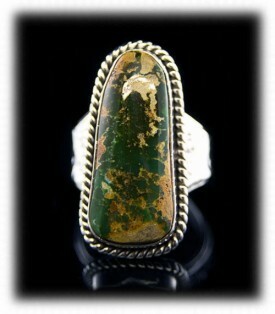 This Royston Turquoise Ring has a Military green Royston Turquoise stone that has beautiful golden brown matrix. It was set in Sterling Silver and is a dynamic piece of Turquoise Jewelry. To the right is a Sterling Silver Bracelet with a lime Turquoise stone from the Carico Lake Turquoise Mine of Nevada USA. Lime green Turquoise is in vogue these days and the fashion industry uses lime colored gemstones in many types of Jewelry as well as accessories. LIme Green Turquoise also comes from the Tonopah Blue Gem Mine, the Damele Mine, the Tortoise Turquoise Mine and the Orville Jack Mine. Green Turquoise is also found in the Kingman Turquoise Mine of Arizona, The Manassa Turquoise Mine and the Cripple Creek turquoise Mines of Colorado and the Cerrillos Turquoise Mine of New Mexico.